Bogdanovich was already well known as a film writer for Esquire magazine; a film programmer for the Museum of Modern Art in New York City; a champion of such directors as Alfred Hitchcock, John Ford, Howard Hawks, Allan Dwan and many others, all of who, he helped bring back to the attention of cineastes. 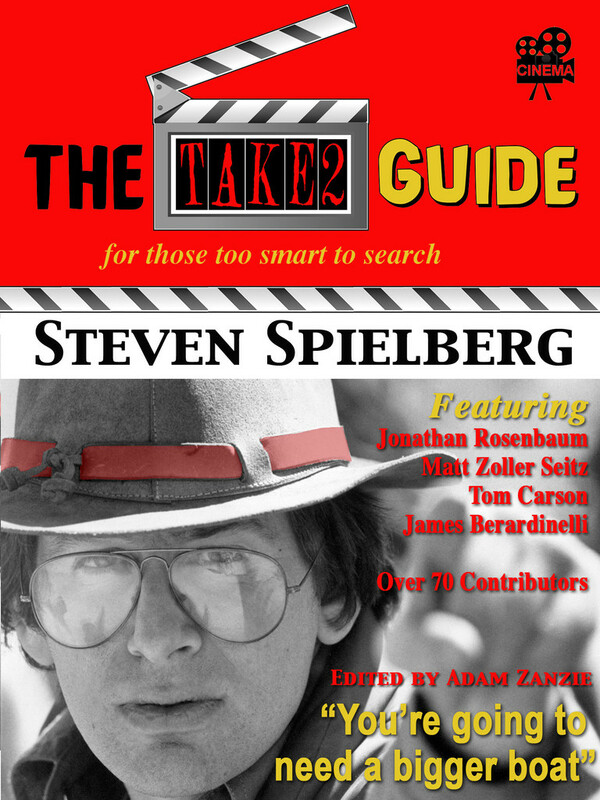 Bogdanovich’s book, “Who The Devil Made It?” is a collection of interviews with these directors, and many others, is an essential read for film lovers. Bogdanovich, along with his then wife Polly Platt, would soon leave New York for Los Angeles where he hoped to break into the film industry. He would meet Roger Corman at a film screening, and eventually was offered a job directing. His first jobs for Corman were on films like “Voyage to the Planet of Prehistoric Women” where he was given two Russian science fiction films and told to add some additional footage resulting in a new film. 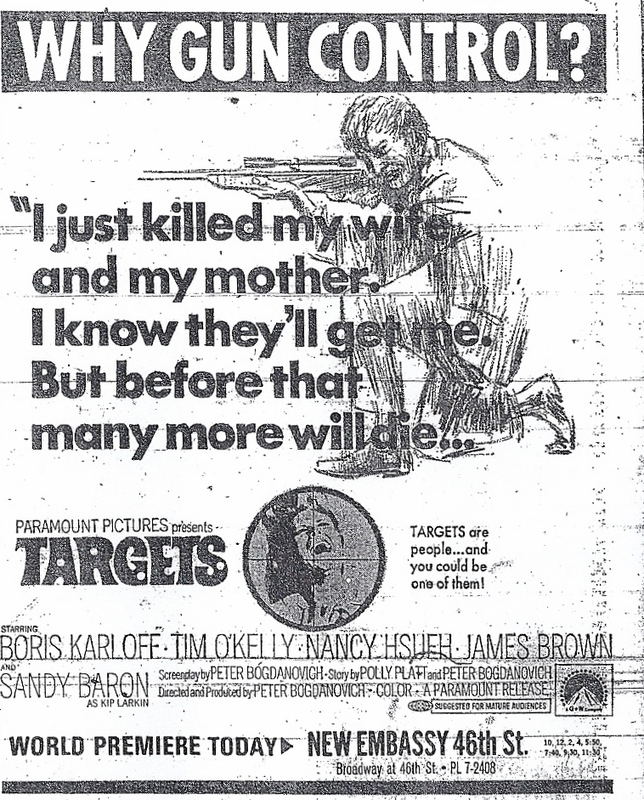 “Targets” was his first film from scratch, well almost. According to Andrew Yule in his Bogdanovich biography “Picture Shows: The Life and Films of Peter Bogdanovich,” Boris Karloff owed Corman two days of work. 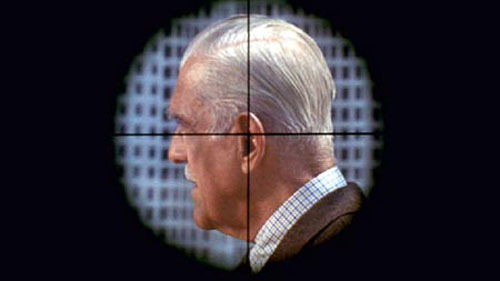 Corman gave Bogdanovich the opportunity to make “Targets” if he incorporated about 20 minutes of outtake footage from Corman’s “The Terror.” He would then be able to use Boris Karloff for approximately another 20 minutes of new footage and he could shoot an additional 40 minutes to fill out the feature, that way Corman had a new Karloff film. Bogdanovich and Platt would write the story and screenplay (according to IMDB Sam Fuller had a hand in writing also) and direct. Corman sold the film to Paramount who purchased it for $150,000 netting Corman a profit of about $20,000. Bogdanovich devised a story about a young man named Bobby Thompson (Tim O’Kelly), he is married, unemployed, very polite to his parents; calls his father sir. The father and son hunt together and seem to be a happy middle class family, though Bobby hints at some strange thoughts he has been having. Bogdanovich parallels this story with a second story about aging horror film star Byron Orlok (Boris Karloff) who wants to retire saying that the horror in his films cannot match the horror that is going on in today’s real world. These two seemingly unrelated tales will converge in a dramatic ending. When the film begins, we are viewing scenes from the low budget Roger Corman flick, “The Terror” (Bogdanovich ended up using only anout three minutes of Corman’s film) with Karloff and a young, then unknown actor named Jack Nicholson in the role of a handsome Lieutenant. Bogdanovich nicely merges these scenes from Corman’s existing footage into the new story. The film within a film, “The Terror” is having its premiere at a local drive-in and Orlok is scheduled to make a personal appearance to help promote it. Meanwhile Bobby Thompson, the seemingly all-American young man is meticulously preparing to murder his wife and mother, and then continues his murderous shooting spree by first picking off unsuspecting drivers on a highway from the top of a water tank and later than evening at a drive-in. The same drive-in Byron Orlok is making a personal appearance to promote his film. Of the two narratives, the Thompson story has the greater substance though for a cinephile, the Karloff sequences and particularly the scenes with Bogdanovich as the young director Sammy Michaels are enticing. Here you have the real Bogdanovich, the young and upcoming director of the film portraying a young and upcoming director, and you also have Boris Karloff, one of the greatest horror stars of all time portraying Byron Orlok, one of the greatest horror stars of all time. Bogdanovich also pays homage to one of his director idols, Howard Hawks, by showing scenes of “The Criminal Code,” a 1931 film directed by Hawks in which Orlok/Karloff stars, playing on a TV. In real life as in reel life, the horror film as Orlok/Karloff knew it was ending. Slasher films of the 1970’s would forge a new gorier titillating horror film far removed the atmospheric, mood drenched films of the past. Today’s horror films are filled with special effects, bloody gore, bug infested creatures spitting out venom that makes Linda Blair’s pea soup antics look enticing enough to eat. As for Orlok, he was right to retire, his time had past and so had Karloff’s who died the following year after “Targets” was released. The character of Bobby is loosely based on the true story of mass murderer Charles Whitman, a student at the University of Texas, who in August of 1966 became one of the most infamous mass killers ever known when he shot and killed 14 people, wounding 31 others, from the tower of an administration building on the University of Texas campus. The Whitman sniper shootings were shocking. Unlike today where we unfortunately here all too often about sniper shootings (Washington D.C. Malvo/Lee), school shootings (Columbine, Virginia Tech) and mass murder (Ted Bundy), the Whitman shootings were still rare enough to send shock waves around the country. The shootings seemed to be just another symptom of all the violence and turmoil that was going on at the time. True, Whitman was not the first, only a month earlier Richard Speck killed eight nurses in Chicago. A few years earlier in the 1960’s, the Boston Strangler went on a two year murdering spree killing 13 women. Go back a little further and there were the two “In Cold Blood” killers, and in 1958 Charlie Starkweather whose murderous rampage would be the inspiration for a series of films including Malick’s “Badlands” and Stone’s “Natural Born Killers”. Today, television shows like “Criminal Minds” have made mass murderers a weekly entertainment event. Films about fictional and real life mass killers have been with us throughout the history of movies, Hitchcock’s “Shadow of a Doubt”, Chaplin’s “Monsieur Verdoux”, and Capra’s “Arsenic and Old Lace” are just a few examples. The first modern day serial killer movies were probably Hitchcock’s “Psycho” and Michael Powell’s “Peeping Tom.” Today films about mass killers still fascinate, remain controversial, and are more violent than ever. “Silence of the Lambs” and its sequels, “Summer of Sam”, “Seven”, “American Psycho,” “The Bone Collector” and “Zodiac” are some of the most recent films. Of these films, Fincher’s “Zodiac” is a few notches above the rest, a masterfully constructed film, with excellent performances by Jake Gyllenhaal and Robert Downey Jr. “Zodiac” was unfairly ignored during the awards season. Though the acting in “Targets” by some of the cast members is not top quality and Bogdanovich never really explains what drives Bobby to do what he does, he makes up for it with some superlative camera work. A good example is the shootings of his wife and mother. We see Bobby is sitting behind a desk; his wife enters the room, curious as to what he is doing. As she approaches him to give him a kiss, Bogdanovich gives us a close up of her leaning forward, her face staring straight into the camera. We then get a quick cut to a close up under the desk, Bobby’s hand is holding a pistol, he pulls the trigger killing her. His mother’s murder and aftermath are done in one long take. 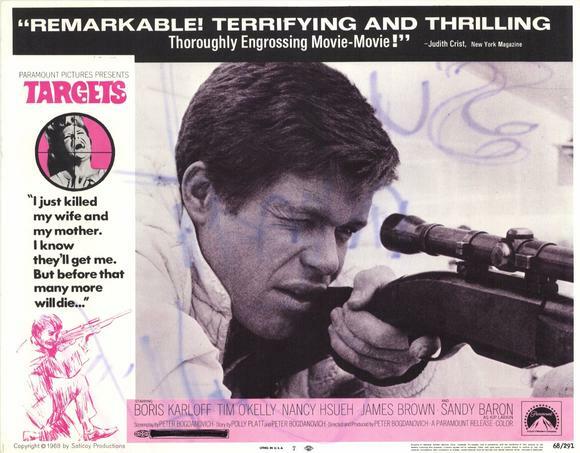 “Targets” is a terrific, self-assured first feature film and one well worth revisiting. This entry was posted in 1960's, Film Reviews, Horror, Peter Bogdanovich and tagged Boris Karloff, Peter Bogdanovich, Targets. This is such a thorough and interesting post on Targets! I’m a sucker for crime dramas and certain thrillers. I really enjoyed Zodiac, Seven and to a lesser extent, American Psycho the second time around. (I went into it the first time taking it way too seriously which ruined it for me). I’m a huge fan of Bogdanovich so this review was very enjoyable. I am a big fan of Bogdanovich too. THE LAST PICTURE SHOW is a masterpiece, I say that without hesitation. I have not seen American Psycho. For some reason I have not gotten around to watching it. I was going to mentioned The Last Picture Show but I felt I would be here all night talking about that crazy little masterpiece! I have to say that I caught the sequel Texasville a few years ago and I LOVED it too! Annie Potts, Cloris Leachman and Bridges had me cracking up throughout! Now that I’ve mentioned it I need to find that film and watch it again. If you haven’t seen it I hope you get the chance to. 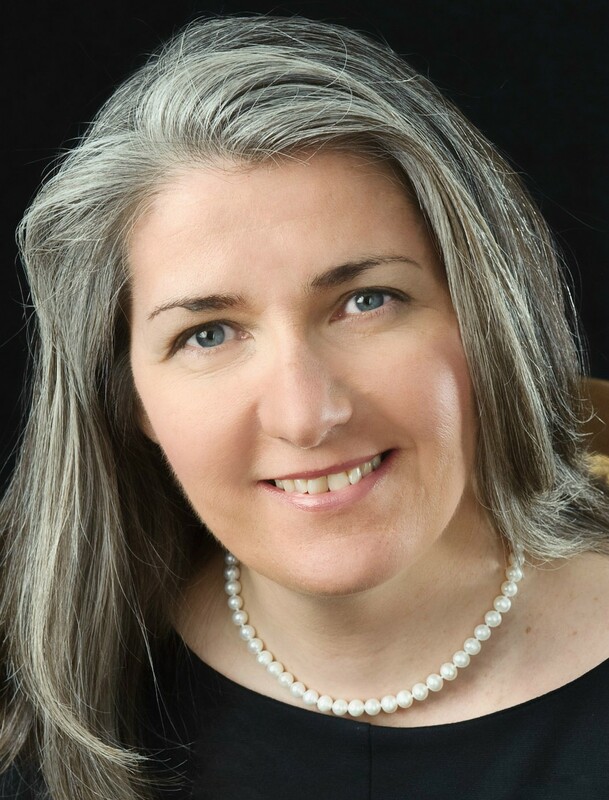 Bagdonavich even signed up for it which surprised me. 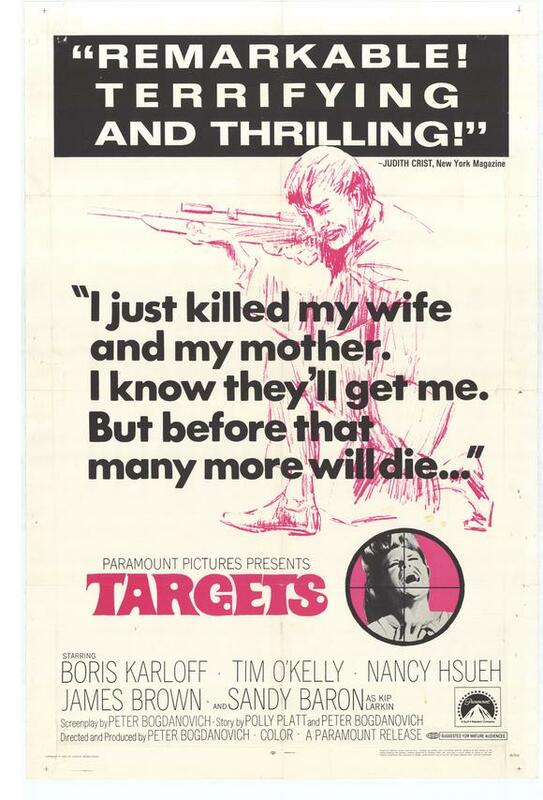 “Targets” is brim full of creativity which makes it eternally fascinating. You are right when you mentioned that Karloff’s presence is special for some of us viewers. However, Tim O’Kelly is very impressive as the disturbed Bobby. It’s right that we never do discover his motivation. Answers are what we seek when confronted with evil and answers are not to be found. thanks for stopping by. Karloff was at the end of a wonderful career and the fact that he portrays a horror screen star at the end of his career mixes real and reel life. One is not sure where one begins and the other ends. This film is one of my favorites. Thanks for the post. And for anyone who gets this on DVD, Bogdanavich offers an inciteful commentary. Ha! I can just hear Karloff saying that! My copy is an old VHS tape I purchased years ago. I need to update! I was surprised at how much I liked this admittedly flawed movie. As you point out in your great essay, the subject matter is sadly still relevant. I loved Boris Karloff (but I like him in most anything) and I remember being taken by what he says at the end, something like “Is this what I was afraid of?” It’s a line that could have come off as fairly cheesy but it resonated coming from Karloff’s mouth. I agree that if Bogdanovich had tried to explain the reasons for his snap it could have come off as ditsy psycho-babble, like the terrible last scene of the otherwise magnificent “Psycho.” I find it more disturbing that we don’t understand why a character like Bobby breaks down, the way it actually is with most actual mass murderers. Again, great review on a little seen movie worth a larger audience. Keep up the good work. Not explaining Bobby’s reasons for snapping is definitely more disturbing than the lame ending in Hitchcock’s otherwise masterpiece. Real life is not neat, so why should films. Thanks again. John, I know this film quite well, as I’m both a huge Karloff fan and a huge Bogdonovish fan (solely for THE LAST PICTURE SHOW) and I found TARGETS to have topical value (which of course he still does!) It’s a disturbing film, orchestrated impressively by the director, who makes roustine ripe with tension and anticipation. It was a noteworthy swan song for Karloff, and a well-regarded work on the Corman catalogue. I haven’t seen this is years, but have the DVD here. Wonderful perspectives all around here John! I am well aware of your love for THE LAST PICTURE SHOW, a film I list as one of my all time favorite also. Thanks again Sir!!! Great post, John. 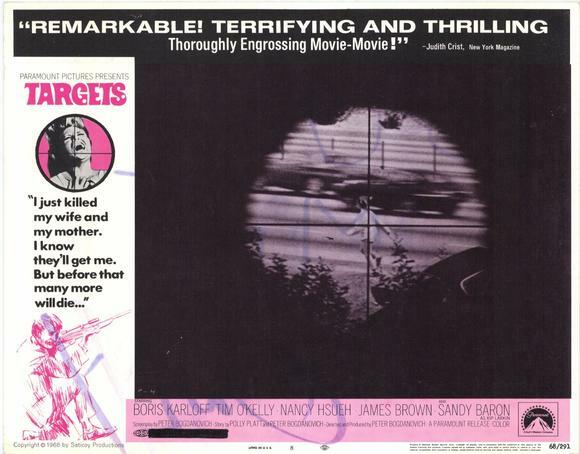 Though I’ve seen clips from “Targets” as part of one documentary or another, it remains a film I haven’t gotten to quite yet. Eve, I agree, Bogdanovich is always interesting to listen too. His interview book “Who the Devil Made it” is one of my favorites. Of his later works, I am wondering if you, or anyone, have seen “Bug?” a disturbing psychological character study. John, great post on an interesting movie. I can’t add to your analysis of the central theme, but there are two other themes of interest, though neither is fully developed. The first is the inevitability of death, as described in the story that Orloff tells the DJ. Just as the servant in the story could not escape death, it seems as though Orloff and Bobby are on meant to collide in a deadly way. Indeed, I wondered for much of the film whether Orloff was terminally ill and that factored into his sudden decision to retire. Clearly, Bobby knows that he will likely die as a result of his action. The problem with this conjecture, of course, is that neither Orloff nor Bobby die when they confront each other at the climax. The second theme that flirts through the film is the similarity between Orloff and Bobby. Both are controlled by others. Bobby is an married adult still living with his parents. His father is clearly overbearing. No one, even his wife, listens to him. Likewise, Orloff was controlled by film producers and, perhaps to a degree, even fans who expected him to make certain films and act in a certain way. This may be a stretch, but clearly Orloff is relieved with his decision to retire. He doesn’t even want to make the drive-in appearance initially. I think the inevitability of death theme hangs over the film. Orloff (and Karloff) looked so old that death seems to be knocking on the door. I don’t know about Orloff being terminally ill but he had to be thinking his days are numbered. As for Bobby, I totally agree. The guy is controlled by everyone, and that may be part of the reason he finally explodes into a violent rage, though he does say something about having some strange thoughts going on inside his head, so there was probably some demons floating around inside.